An advanced program for your level 5 Spanish students! 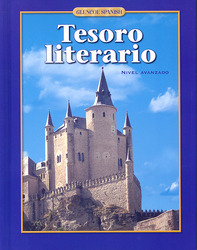 Tesoro literario is an advanced Spanish text that contains 10 units, each focusing on a different literary genre and related theme. Each unit contains an introduction of the genre, a selection of literary works that represents that genre, comprehension exercises, vocabulary, as well as written and oral exercises that promote critical thinking, opportunities for conversation, and a comprehensive review of a few structure points. Familiarize your students with the diversity of Hispanic literature as well as with many different authors through a variety of readings. Reflect upon the political thought and social behaviors of different Hispanic cultures using contemporary selections. Give your students a chance to practice their Spanish with communicative activities as they interact with other students. Feature diverse authors that include Octavio Paz, Isabel Allende, Federico Garcia Lorca, and Miguel de Unamuno. Assess your upper level students with ExamView® Pro Testmaker CD-ROM which allows you to customize tests from fully editable questions, or add your own questions to create original quizzes, tests, and exams.